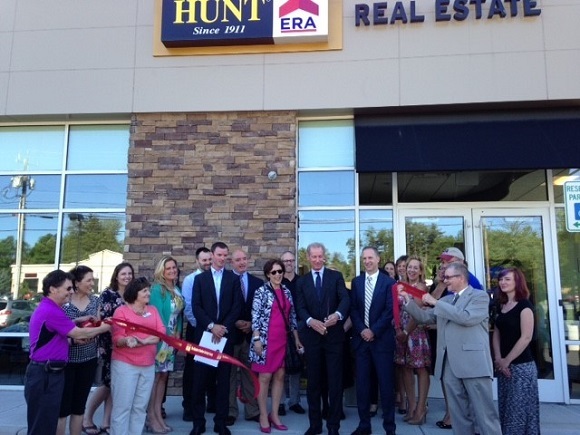 A ribbon cutting was held to celebrate the Grand Opening of the Hunt Real Estate ERA office at 1750 Route 9, Clifton Park. Pictured Center is Peter F Hunt, Chairman & CEO; Charles F Hunt, Executive Vice President & Chief Operating Officer and Mark Phoenix, Branch Director. Joining in was the agents along with Gina Wierzbowski representing Assemblywoman Mary Beth Walsh, Pete Bardunias, President/CEO of The Chamber of Southern Saratoga County along with Chamber Ambassadors Garry Packer from Walton Realty Group; Linda Tepper, owner of The Tepper Group; Joyce Maddalone from Mother Teresa Academy; Rich Griesche from Catskill Hudson Bank and Beth Silvestri from Brookside Museum.